Will the United States’ next fighter jet place more emphasis on energy efficiency than radar evasion? Despite uncertainties regarding the current generation of advanced fighter aircraft, the US Air Force is proceeding with the development of the next generation, slated to enter service sometime after 2030. Today the Air Force is investing heavily in F-22 and F-35 stealth fighters, both types manufactured by Lockheed Martin. The last of 187 F-22s will roll out of Lockheed’s Georgia facility later this year. Production is just getting underway in Texas and Georgia on as many as 1,763 Air Force F-35s. 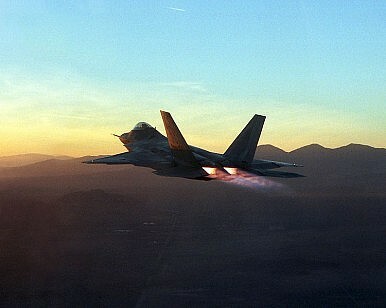 The F-22, tailored for aerial combat, costs more than $300 million per copy, once developmental spending is factored in. The ground attack F-35 is slightly cheaper, though by how much remains unclear at this stage in the programme. Both jets have been vexed by mechanical problems. The F-22 force is currently grounded following a fatal crash possibly tied to the F-22’s onboard oxygen-generation system. The 20-strong F-35 test fleet is also grounded owing to problems with an internal electrical generator. Budgetary pressure curtailed F-22 production and could also reduce the F-35 buy, despite the recent appearance of rival stealth fighter designs from Russia and China. Japan is also working on a stealthy design. Perhaps motivated by the Russian and Chinese developments, the Air Force is already refining its concept for the fighter after the F-22 and F-35. The so-called ‘F-X’ remains an unfunded, largely informal programme with no prospect of production before 2030. Most of the work on the new plane is being carried out by the Air Force Research Laboratories (AFRL) under Maybury’s direction. Two separate research initiatives underpin the evolving F-X concept and help explain Maybury’s ‘More-Electric Aircraft’ descriptor. AFRL is working on a new aircraft electrical infrastructure that's loosely modelled on commercial hybrid car designs. A plane incorporating hybrid-style electrical systems wouldn’t need the bulky, sluggish hydraulic systems installed in current airplanes and could be more efficient. The change could help the Air Force reduce its fuel consumption, currently averaging around 2.5 billion gallons a year. Also, with more and better electrical power, the More-Electric Aircraft could include laser and microwave weapons and more powerful sensors, potentially including the ability to launch ‘electronic attacks’ by jamming or inserting software viruses into enemy radars. To power the More-Electric Aircraft’s electrical systems, AFRL is pursuing a new type of jet engine. This advanced propulsion represents the other research initiative for the new fighter. It would be a ‘combined cycle’ engine meant to be equally efficient for low-speed cruising and high-speed sprints – a feat impossible for today’s power plants. An effective combined-cycle engine could result in performance and efficiency benefits on top of those offered by the new electrical systems. Currently, AFRL spends around $300 million a year developing the electrical systems and combined-cycle engine that underpin the More-Electric Aircraft. That sum will undoubtedly increase as both initiatives gain momentum and the F-X slowly evolves into a formal programme. Whether, and at what point, the cost causes a backlash by a deficit-conscious US government remains to be seen. The Air Force will eventually need a new fighter to succeed the current planes. Maybury is betting that his More-Electric Aircraft will fill this F-X niche, but other prospects are sure to emerge in time. By the same token, the United States’ long-term fighter plan, itself partially a response to Russian and Chinese developments, is sure to prompt responses by Moscow and Beijing. For sure, both countries have proved that they’re determined to follow where the US Air Force leads. Is China’s J-20 stealth jet likely to be a bomber or an interceptor? It might not actually matter.